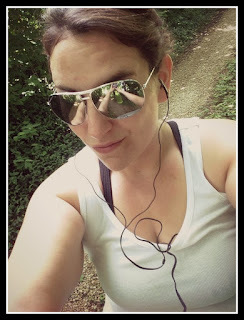 The Missouri Mom: Running without Reason - or at least that is what I thought. Running without Reason - or at least that is what I thought. Me out for a Run. marvelous job sharing tips, ideas, and fitness strategies - that is not me. However, I have a story to share that brought tears to my eyes and made me realize the impact I have on others - even when I am not writing. If you don't already know; I live in a small (maybe super tiny) town, pretty much everyone knows everyone one way or another - or at least we recognize each other in passing. "You are that lady that runs through town all the time, I use to think running was for skinny people, but then I saw you running and walking all the time, so I decided I would try it and I have lost 10 pounds"
Well I was at first taken back by the fact that she basically referred to me as the opposite of a skinny person (dang it words hurt) then I stood there for a minute and thought; WOW I MOTIVATED THIS PERSON JUST BY BEING MYSELF. I smiled at the girl (hopefully in a kind manner) and said congrats on the 10 pounds, I hope you continue to exercise then quietly slipped out the front door. As I sat in my car in front of the grocery store I couldn't help but cry for a moment and thank God that I have found myself through exercise. Fitness - although many would say this is an excuse - has not always been easy for me. Honestly, I hate running - in fact for a long time my runs would be an ongoing argument with God as to why I was blessed with Abernathy hips (child bearing hips) and a mommy tummy - I never understood why he couldn't just make me naturally skinny! Then later I found sanctuary in fitness - I soon realized that no one around me loved to run so I at least got that time to myself. Now it has just become second nature to me - If I don't do it, I just don't feel right. I may not look like a supermodel running (or at all), but I do know that my heart, my brain, and most every other part of my body is healthy. I feel good and that means more than anything else in the world. Start Small Go Big - you don't have to run/walk 5 miles the first day you lace up your shoes - it is okay to set small goals and increase them as you go! Cheat Run - you are the ONLY person that should be judging your ability - if you can't run for 2 miles then DON'T - in fact I rarely run the whole time I am out there - I often run a few minutes walk a few minutes - this keeps my heart rate up, but does not kill me! Stay Hydrated - Always Always carry water with you, because if you feel crappy you won't want to do it again!